When faced with the decision of choosing a new front door, there are many things think about, such as the colour and style, whether it will complement your home and most confusingly, the material it is made from! Should you choose a composite door or a uPVC door? Front doors come in a variety of different materials and styles, from traditional solid wood front doors to aluminium, composite and uPVC. One of the most popular questions we get asked here at Paradise Windows is about the differences between composite and uPVC doors and. Hence, one of the most confusing choices that customers are often faced with is whether to add a composite door or a uPVC door to their home. We are going to break down the differences between the two options to help you choose a new door that is right for you and your home. Durability: uPVC windows are strong, long-lasting and resistant to all extreme weather conditions so are not likely to age or slow signs of wear and tear due to extreme sunlight or cold temperatures. Energy-Efficient: uPVC doors are well-known for their insulating properties and by replacing an older wooden framed door it is highly likely your energy bills will be reduced. Low Price: uPVC doors are a great economical option, often significantly cheaper than their aluminium or composite counter-parts, yet just as long-lasting. uPVC doors generally have a smooth look to them, and although they often are seen in white, can be made in any colour. Some of us prefer our front door to have some texture and if this is the case, then you are probably more suited to a composite front door as they often come in different textures to look like other materials, such as wood. Do I Have to Choose a uPVC door if I have uPVC Windows? It is easy to be mistaken into believing that only uPVC doors will complement a home with uPVC windows, however this is definitely not the case. A composite door can look great when matched with a full-set of uPVC windows, so if you decide that you would prefer a composite door despite having uPVC windows, then don’t despair! There will be many composite options to suit your property and we’re always happy to advise you on the best options. A composite door is made differently to a uPVC door, usually being composed of several different materials including uPVC, insulating foam and GRP (Glass reinforced plastic). Combined, these materials produce an extremely hard-wearing, secure and long-lasting front door that also look particularly stylish and complement a range of window styles and materials, including uPVC. Because of the way composite doors are made, they can come in many different styles and textures so it is very easy to find an option that will match your home. Weather Resistant: Due to their hard-wearing GRP components, composite doors are built to last and will not be warped or swell in damp, hot or extreme cold weather conditions. So Which is Better, uPVC or Composite Doors? Both materials are great choices for a new front door and will most definitely make your home look more inviting (great if you are trying to sell or are renovating!) and reduce droughts and noise pollution from outside. While one is certainly not better than the other, a composite door is a slight upgrade on a uPVC model due to its extremely high-durability, security and extra-stylish looks. However, uPVC doors are extremely popular and are also well-known as a high-performing, insulating and secure choice of front door. 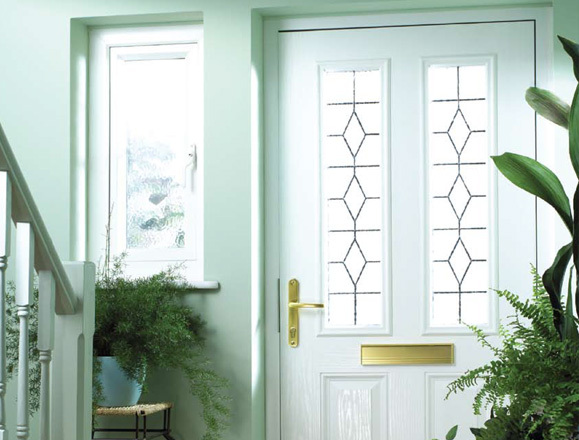 If you are interested in upgrading your front door, our friendly and helpful team are always on-hand to answer any questions and provide you with a free, no obligation quote. We are based in Bicester, just outside of Oxford in Oxfordshire and cover all local areas including Whitney & Headington. We supply and fit a wide range of new front doors, including composite doors, uPVC doors and aluminium doors. We also have a stunning range of windows to complement your new door. Just get in touch and we will be happy to help and provide you with a free-quote.